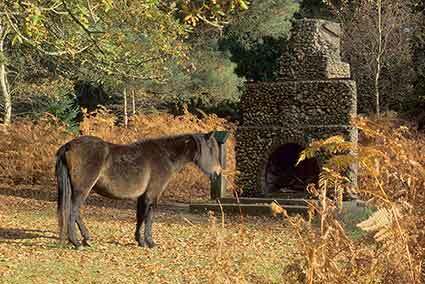 The Portuguese Fireplace can be found by the roadside close to Millyford Bridge - 2 kilometres (1¼ miles) from Emery Down, near Lyndhurst, beside the minor road leading towards the Bolderwood Deer Sanctuary. Almost adjacent grassland bumps and hollows mark the site of a contemporary Canadian Forestry Corps camp, whilst 0.75 kilometres to the west, across the minor road, by a gate leading into the woods, is a short length of fairly deep cutting bordered by substantial moss-encrusted banks - this was part of the route of a First World War narrow gauge railway used to take timber to a sawmill located close to what is now the Millyford Bridge car park. In fact, by that car park, on the northern side of the minor road still lies a quite large rectangular concrete block; and on the other side of the road can still be seen building foundations. All are the remains of First and Second World War sawmills.